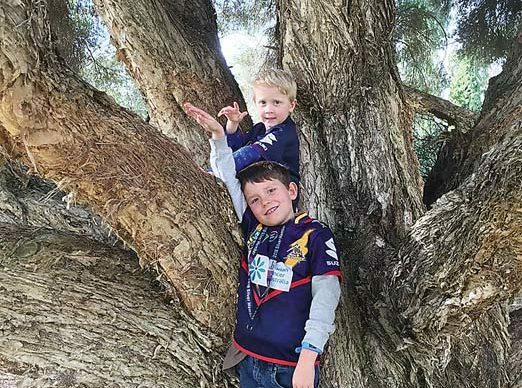 BROTHERS Bradley and Lucas Banks are excited to be taking part in the annual Kids Fun Run with K163 this weekend, to help raise funds for the special care nursery at Frankston Hospital. The fun runs, where children get to run alongside the historic steam train K163, go from 150 metres for three-year-olds out to four kilometres. Each runner will receive a show bag and a personalised certificate at the event, Sunday 18 November at Moorooduc Railway Station. Rotary Club of Mount Eliza is helping organise the event. The Banks family are one of the top fundraisers for the event with $250 so far, which will be used to help care for the hospital’s littlest patients. Bradley agrees with his mum that the event is for a great cause. He was a patient at Frankston Hospital once himself when he had asthma. The seven-year-old will be lining up for his second fun run this year, with four-year-old Lucas running for the first time. “Last time was fun and I did my personal best, but I didn’t care how fast or slow I was,” Bradley said. Register online at www.k163funrun.org.au or register at the run on Sunday but be sure to allow sufficient time before your run.